Dan Senda is an example of someone who has always worked exceptionally hard for everything he has achieved. Desire and determination are traits that you easily identify in the man when you spend time with him. He hasn’t played in a World Cup, and he hasn’t played in the Champions League, but he personifies classic British hard-graft. What Dan Senda has done in his time in football is persist, and with that he’s managed to achieve what few do – sustain a long career as a professional player. Senda moved between League 1 and 2 in a 16-year career that began at Wycombe Wanderers in 1998. After three years at iconic London club Millwall FC, Senda moved around the English game until he eventually retired due to persistent injuries just before his 32nd birthday. When he explains how he left the game, it’s clear to see that the decision was made for him. Naturally, a lot of players who want to remain in the game after playing for so long and will take a job with a senior team, assume they are entitled to go into management straight away or understandably work their contacts to get them a job which will provide security for their family. The world of playing professional sport makes coaching look as stable as a degree in accounting and a nice secure job with a multi-national company. Being a football player is by nature exceptionally fickle and an individual’s value can be decided on at the whim of a manager or board, so longevity is an attribute to be admired in the game. It’s what Senda has done since retirement that has captured our attention. Dan has kept a relatively low profile and gone about his business quietly as he looks to learn a new craft – the art of coaching. 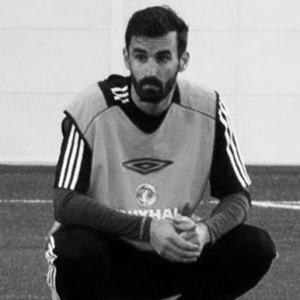 With his playing days done but decades of learning in the bank in terms of game understanding, Senda has taken the unique approach of doing his apprenticeship working with very young players as a coach at Brentford FC within the club’s highly rated, category two academy. We asked Dan to explain his decision to begin working with pre-academy and foundation phase aged players (5–12) and why he didn’t just go straight back into senior football. With good reason for his approach and a hunger to learn, I asked Dan about his initial experiences in the intense world of academy football and what he made of his first year in the environment and what he thought of the newly implemented, EPPP (Elite Player Performance Plan) in England? It’s well documented that the U21 age group and the professional development phase in English football is one of the more challenging areas at present. It is somewhat of a black hole, with many players disappearing before they’ve had a chance, or alternatively not being allowed enough time to develop due to age restrictions. This, combined with the lack of proper regular competition, means there are challenges that need to be addressed. As a former professional player, Dan clearly has a lot of experience but as a young coach currently working on his UEFA B diploma and having completed the FA Youth Award Level 1 & 2 courses, what lessons has he taken in his journey so far? So with a desire to develop and work towards his goal of eventually becoming a senior manager, who has been influential on Dan as a mentor and in terms of managerial styles so far? As the conversation flows, we get on to the topic of the challenges of coaching young players versus professional or senior players. What are the key differences and would Dan change his style depending on the age of the players he had under his guidance? Having been involved in English football his entire life, and England being a country which criticises itself at times, what particular attributes does he believe English players have? Senda makes a great point. When the motivation becomes extrinsic, then the reason for playing is entirely different and can drastically affect how a player develops. Now that he is working with some of the top talent in England, many of who may go on to play in League 1 & 2 just as he did. I ask Dan about the playing style within the Football League and if he believes a new style of player is emerging in England? Now working across age groups from the pre academy boys, U13/14 players and also in the clubs College Program, it appears that Brentford FC may have stumbled upon a hidden gem. In Dan Senda, they have a humble man who always coaches with a smile on his face and maintains a calm demeanour. Senda is motivated by his own desire to learn and an affection for helping young players in their quest to go beyond what he achieved as a player. Many of his young charges will not even realise that when they’re working with Dan Senda, they are working with a man who has achieved the goals that they are all trying so hard to get to themselves – the dream of a career in the beautiful game. Despite this blissful ignorance, it appears these young footballers have a mentor that in due time, they will realise had a positive impact on their own player development.